Plentiful sunshine. High near 80F. Winds SSE at 10 to 15 mph..
Driving home one winter night, the moonlight shining brightly on a cut down cornfield looked so beautiful to Lisa Haag Kang that she later wrote a poem about it. The poem, “Stiletto Moon,” is the last in a collection that Kang has put together in a new chapbook by the same name. Kang, who teaches civilization classes at East Central College in Union and English, World Literature and composition classes at St. Louis Community College’s Wildwood campus, said the poems in this collection are a kind of a ruthless look at the way the things that happen in life knock the rough edges off of us. “It’s a hard look at what pain and loss and difficult things do to you. It kind of knocks the rough edges off, and it hurts, but at the end of it all, if you’re willing to look at what’s left in an unflinching way, you realize there is a kind of beauty in it,” she said. “So the poems are about being fearless and looking at what has happened, what’s left and what can be, and being willing to say it,” said Kang. 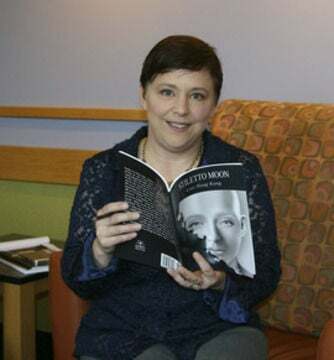 With titles like “Vanishing Twin Syndrome,” “Parenting on the Autism Spectrum” and “On Skin Cancer and Devotion,” the poems in “Stiletto Moon” are personal, but never weepy or sentimental, Kang stressed. It is not a collection meant to make a reader necessarily feel good. But as Eve Jones wrote in reviewing the collection, “I feel that rare privilege, the sense of being witness, page after page, to the poet’s coming through hard truths about sorrow and alienation, hunger and devotion. Kang, who has a bachelor’s degree in Chinese language and literature and a master’s in Asian studies, started writing poetry when she was in the MFA program at Lindenwood University, where she went on to earn an MFA in creative writing. “I always had a way of looking at the world and using language intensively, which is what poetry does, but I didn’t start writing it seriously until I was in the MFA program,” she said. Many people think poetry has to rhyme to be good, but many professors, in fact, tell their students never to rhyme their poems, said Kang. For the most part, contemporary poetry tries to resonate with readers on a more emotional level, a human connection level, said Kang, and that is what her new collection does. “Sometimes the poem appears in your head and insists on being written down right away,” she said. Kang often carries a small notebook with her for that reason. She also has used napkins to jot down ideas or the Notes app on her smartphone. Through that process, often a poem becomes something Kang never envisioned at the start. “A poem is most honest in its first draft, but it’s not necessarily the best,” she said. “Then you begin to use word craft and shape it, maybe even distort it to sort of fit some other level that you are trying to talk about or even just give attention within the piece. “Art is that way too. (Poetry) is like a painting in words,” she remarked. As a poet, she strives to keep each piece true to its original root, “but sometimes you have to really be willing to let that go to make it the best piece that it can be,” said Kang. Kang said although she may write down the beginnings of a poem with pen and paper, she prefers the computer when she really begins to work on a piece. Whenever a poem isn’t working, one trick Kang likes to use is something her professor taught her — flip it upside down so the last line becomes the first. Kang said her children tell her that she is really good at being hyper-focused. She can write her poetry anywhere — even in the middle of the family room with the TV on and all sorts of activity going on around her. She also finds comfort and a sense of control in the written word. “When there are a lot of problems, you don’t know what’s going to happen, but these words on this page are going to stay that way until I change them,” she commented. “Stiletto Moon” is Kang’s second chapbook to be published. A third is in progress. For Kang, putting together a chapbook of poems begins with taking something from the previous collection and move it forward. She also looks through old pieces that never made it in to a book to see if any fit the new theme. Then once she has an idea of where the book is going, she deliberately starts writing new poems. “In the end, a chapbook is like a big poem,” said Kang, explaining that a chapbook is basically a small collection. “Stiletto Moon,” for example, has just 26 poems and is only 43 pages long. “Poetry tends to ask more questions than it answers,” said Kang. “I like to have the last poem pull it all together, and then that becomes the title of the collection because that’s where it’s heading throughout the collection. Copies of “Stiletto Moon,” published by Aldrich Press, are available on Amazon. 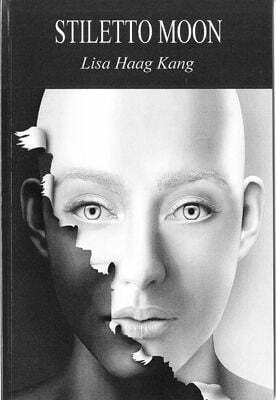 People also can order a copy by contacting Kang directly through her website, www.lisahaagkang.com. The cover art Kang used for the book is striking, a face with a layer of something being peeled away. It was created by Polish surrealist artist Igor Morski. Kang first saw the image on Facebook, but had to do an image search online to find out more about it and how to contact the artist. Morski told her the image had only been used once before, 20 years earlier as the cover of a psychology book in Poland. Kang knows there are many other people across Franklin County who write poetry, and she is interested in starting a critique group where they could get together to share each other’s work and bounce ideas off of each other. People who are interested can contact her through her website. Writing poetry is just one of many creative outlets Kang has. She is writing multicultural picture books, as well as an adult coloring book about New Zealand, and she also writes directions for how to make multicultural crafts, many of which have appeared or will be appearing in Highlights magazine. Several of the crafts directions are featured on her website and include things like a girl’s Mongolian headdress and windows inspired by Moroccan architecture. Kang also enjoys taking these kinds of multicultural crafts into classrooms on school visits, helping teach students about worldwide cultures in fun, hands-on ways. Kang, who offers this to local teachers completely free of charge, said she would like to do more of it. She has helped first-graders create a craft for Chinese New Year and sixth-graders with crafts as they learn world history. Kang said the crafts are typically for lesser known cultures, but she explains to students why the craft is significant to the culture.